The mentor and mentee have more in common than the Utah Jazz and the University of Louisville. Both are known for their high-flying dunks. Former Utah Jazz star Darrell Griffith was appreciative yet confused when his former team called him the day before the 2018 NBA Slam Dunk Contest to offer him a flight to Los Angeles, a hotel room and tickets to the contest. The timing was too late for the former University of Louisville star, and he respectfully declined the offer. Griffith made sure to watch the dunk contest to see his mentee, Jazz rookie sensation Donovan Mitchell, participate. 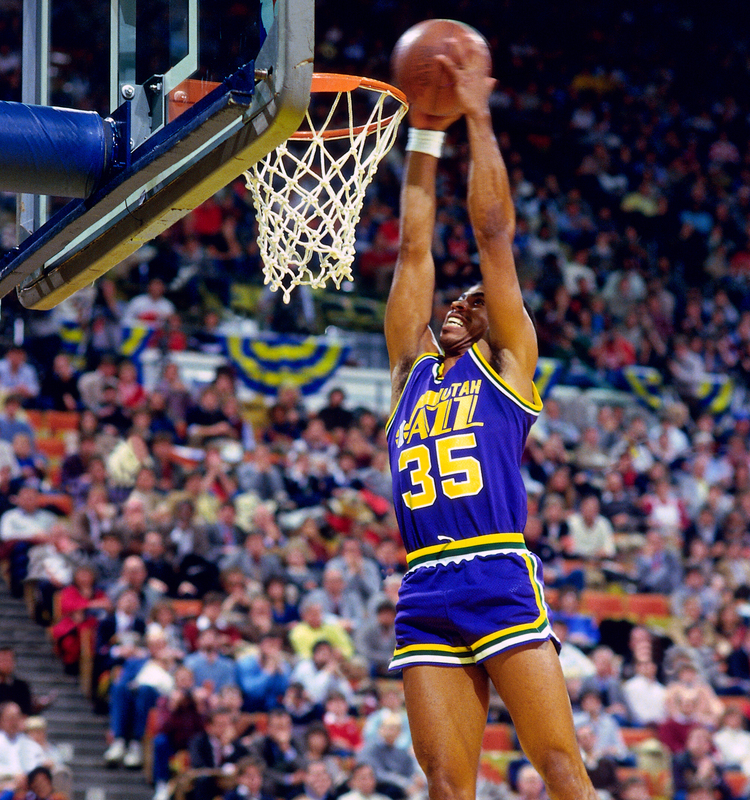 And when Mitchell put on Griffith’s vintage Jazz uniform during one of the winning dunks, it suddenly made sense to Griffith why his old team had tried to get him to L.A. Griffith proudly watched Mitchell dunk in his honor and go on to win the contest. “I had no clue about it,” Griffith said. “He wore my jersey, and that was my actual jersey and shorts. That was my actual uniform, one they had in the archives. Once he wore my jersey, I said, ‘Ah, no wonder they wanted to fly me out.’ And he happened to win it. 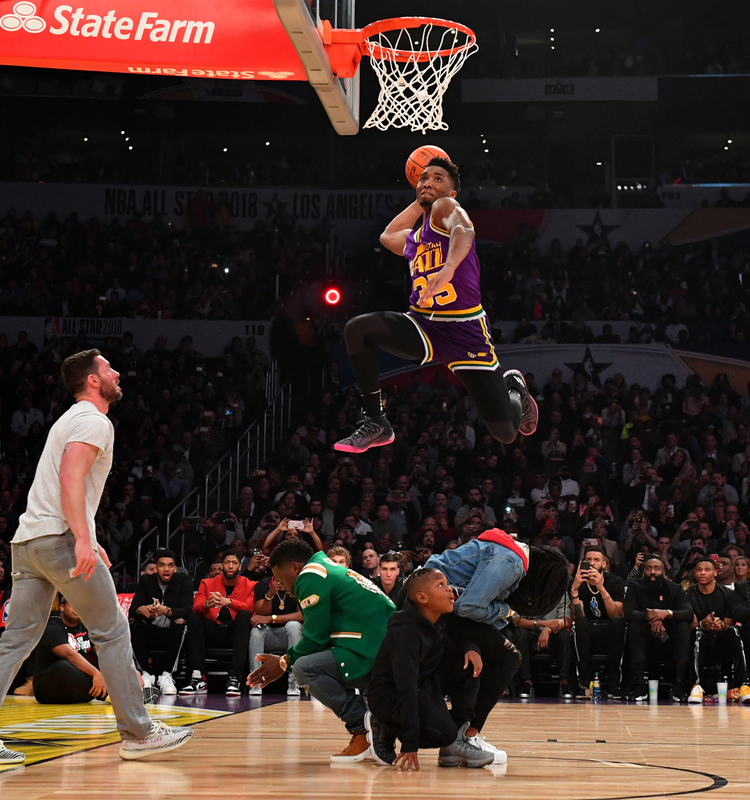 Donovan Mitchell of the Utah Jazz dunks over Kevin Hart (center left) and crew during the Verizon Slam Dunk Contest during State Farm All-Star Saturday Night as part of the 2018 NBA All-Star Weekend on Feb. 17 at the Staples Center in Los Angeles. Mitchell is not only an NBA Slam Dunk champion, but he is also a top candidate for the 2018 NBA Rookie of the Year award. Griffith won the NBA Rookie of the Year award in 1981 while playing for the Jazz. The 20-year-old Mitchell has regularly credited Griffith for giving him the needed advice to put himself in this position, including pushing Mitchell to work on his jump shot. Griffith first learned about Mitchell when then-University of Louisville basketball coach Rick Pitino walked over to Griffith at practice three years ago and pointed at a freshman he needed to keep an eye on. The freshman was Mitchell, whose stunning athleticism is Griffith-like. Griffith first became a local star in his hometown of Louisville, Kentucky, when he dunked on then-American Basketball Association star center Artis Gilmore of the Kentucky Colonels in an outdoor basketball game as a freshman in high school. Griffith turned down an opportunity to play professionally for the Colonels after high school to sign with Louisville. Known as “Dr. Dunkenstein” for his high-flying dunks, he scored 23 points to lead the Cardinals over UCLA to win the 1980 NCAA championship. The 1980 John Wooden Award winner, given to the best player in college basketball, left Louisville as its all-time leading scorer with 2,333 points. Griffith was selected with the second overall pick in the 1980 NBA draft by the Jazz, one pick before Kevin McHale was selected by the Boston Celtics. The 6-foot-4, 190-pound guard averaged 16.2 points during his 11-year NBA career that was played entirely in Utah. The 1981 NBA Rookie of the Year averaged at least 20 points during three seasons and had his No. 35 jersey retired by the Jazz. Griffith joined Larry Nance Sr., Michael Cooper, Clyde Drexler, Julius Erving, Edgar Jones, Ralph Sampson, Dominique Wilkins and Orlando Woolridge in the first NBA Slam Dunk Contest in 1984, won by Nance. “With the Jazz, he was averaging 20 points per game, he scored 30 like 50 times. He was incredible back during his time with the Jazz,” Mitchell said. Darrell Griffith of the Utah Jazz dunks the ball during the Slam Dunk contest as part of the 1985 NBA All-Star Game at the Hoosier Dome in Indianapolis on Feb. 10, 1985. Mitchell added that he was impressed not only by Griffith’s basketball résumé in college and the pros, but also the fact that he was a respected community member in Louisville who had a “black-owned business” with the soul food restaurant Griff’s. Griffith quickly took a liking to Mitchell after watching him play for the first time. The two began to get to know each other better at Louisville events and games. Mitchell also regularly came into Griff’s to order chicken and waffles and gain wisdom from Griffith. Mitchell averaged 7.4 points and 3.4 rebounds as a freshman for the Cardinals during the 2015-16 season but shot only 25 percent from 3-point range. Griffith eventually offered some words of wisdom to Mitchell after his freshman year that the latter intelligently took to heart. “I told him to stay headstrong and that you have to be focused when you play under Rick because he is going to push you and be hard on you. But it’s all for the good,” Griffith said. “But one of the main things I told him, especially after watching him play: ‘Man, if you get your jump shot down, dude, you take your game to a whole different level.’ His jump shot was good. But he needed to work on it more and be more consistent with it. Mitchell listened and worked diligently on his jumper before the 2016-17 season. The 6-foot-3, 211-pounder averaged 15.6 points and 4.9 rebounds as a freshman. He improved his 3-point shooting percentage to 35.4 percent as a sophomore. After a strong showing at the NBA pre-draft camp in Chicago last year, Mitchell decided to forgo his final two seasons at Louisville to go pro. Mitchell credited Griffith for his improved shooting. “It’s one of those things where he said it when I was a freshman and you hear so many things from people to work on. That season I shot 25 percent from 3,” Mitchell said. “That is one thing he kept telling me about. And my sophomore year I jumped to 35 percent. You never thought that he would be so right so soon. I wasn’t expected to be here [in the NBA], so when it happened, [Griffith] reminded me of [his advice]. The NBA also liked what it saw in Mitchell, as he was selected with the 13th overall pick in the 2017 NBA draft by the Denver Nuggets. The Jazz immediately traded for the rights to Mitchell in exchange for forwards Trey Lyles and Tyler Lydon. Griffith believed that his beloved Jazz were a perfect organization for Mitchell. 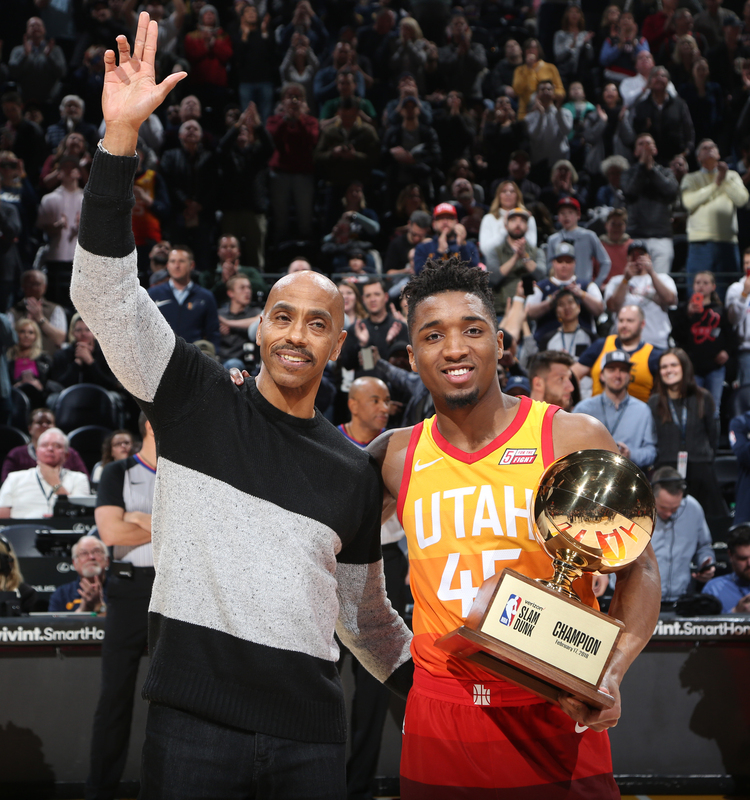 Darrell Griffith (left) and Utah Jazz rookie Donovan Mitchell share Mitchell’s dunk contest trophy with the crowd at vivint.SmartHome Arena on Feb. 23 in Salt Lake City. One thing Griffith didn’t mention during that phone conversation was that Salt Lake City had a small black population. Griffith grew up in a predominantly black West Louisville neighborhood from which boxing legend Muhammad Ali also hailed. Griffith told The Undefeated last year that he initially struggled to adapt to living in Salt Lake City since there were hardly any blacks who lived there. According to City-Data, Salt Lake City was 3.5 percent black, 65.5 percent white and 20.5 percent Hispanic in 2016. Mitchell, a native of Elmsford, New York, said he didn’t worry about or have any trouble adapting to a city with few African-Americans. “It was one of those things that I just figured out on my own,” Mitchell said. “I went to a private school where I was probably the only African-American kid in the entire school of about 580 students. I’m kind of used to that, so it wasn’t something I was far removed from. Griffith quietly wondered if Mitchell made the right decision by going pro after his sophomore season. Mitchell showed he did by leading the 24-team Las Vegas Summer League in scoring with a 28-point average for the Jazz. “After seeing him in the summer league, I was like, ‘Man, he is killing.’ Looking within, a player knows what he is capable of doing. He made the right decision,” Griffith said. Mitchell quickly went from being a rookie to a star with his high-scoring games and dunks. Mitchell entered Thursday leading all NBA rookies in scoring, averaging 20 points per game through his 68 contests. He has been named the Western Conference Rookie of the Month three times. Mitchell was the only rookie this season to score more than 1,000 points before the All-Star break (1,076). He also scored 41 points, a Jazz rookie record, on Dec. 1 against the New Orleans Pelicans and 40 points against the Phoenix Suns on Feb. 2. “Utah called me when he got 41 points,” Griffith said. “Derek [Garduno], the PR guy, texted me and said, ‘Donovan just broke your record.’ I said, ‘What record?’ He said the most points scored by a rookie. I said, ‘I never knew I had it.’ I didn’t know. All that rookie stuff that Donovan is doing, like him, I just balled when I was in Utah. While Philadelphia 76ers rookie Ben Simmons offers stiff competition, Mitchell has an opportunity to join Griffith as the only NBA Rookie of the Year winners in Jazz history. So does Griffith believe Mitchell should be the Rookie of the Year? Earlier this week, Louisville informed interim head coach David Padgett that he would not be retained. Padgett took over when Louisville fired Pitino after the FBI investigation into college basketball last fall. The allegations against Louisville included payments of $100,000 to the family of Brian Bowen to sign with the school. Bowen was suspended by the university before transferring to South Carolina. “I am just sitting back and digesting it all,” Griffith said. “I’m waiting to see what is really going to come out of it. I think the penalties that the NCAA gave the school was unusually extreme. It made no sense. Griffith said there is a “big buzz” about Mitchell in Louisville that takes Cardinals fans’ minds off the school’s turmoil. He said he gets texts regularly about Cardinals fans about Mitchell. Griffith also told Mitchell that his dunk contest performance was a “big bright spot” for Louisville and its fans. Mitchell said that when he was preparing for the dunk contest one of the first creative things that came to mind was honoring Griffith by wearing his jersey. He also wanted to put a smile on the faces of Cardinals fans in the process. Mitchell also wore a “custom hoodie” with Griffith’s name on it the day before the dunk contest. A similar hoodie is on its way to Griffith. Mitchell said his plan all along was for Griffith to learn about him honoring him while watching the dunk contest. Griffith was able to accept a plane ticket offer from the Jazz shortly after NBA All-Star Weekend to present Mitchell with his 2018 NBA Slam Dunk champion trophy in front of Jazz fans during a game against the Portland Trail Blazers on Feb. 23.